The ideal vegetative or flowering chamber! For enterprising indoor gardeners, the HomeLab 145 offers additional space and growing potential. 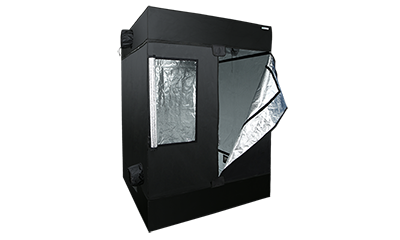 Perfect for housing a single 4′ x 4′ tray, this grow tent is well illuminated by a 600 or 1000-watt lighting system. It´s durable metal zipper and seams have been upgraded to provide even more strength and roof ports allow easy and secure mounting for ventilation and air-filtration equipment. The HomeLab 145’s versatility makes it an integral part of any perpetual indoor growing system. Double-Layered Air Ducts: Get air in and out of your HomeLab without light leaking out thanks to the extra layer added to all air duct ports. The waterproof coating and light barrier on the zipper contains both light and spillages. HOMEbox - your perfect growbox or grow tent for indoor gardening!